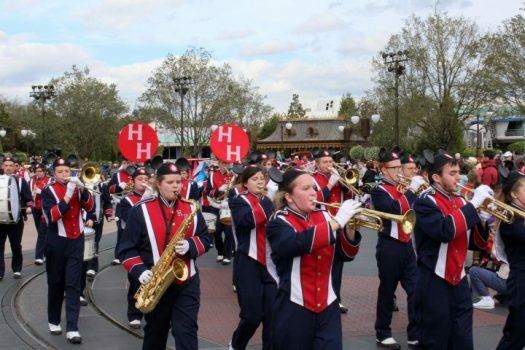 The marching band at Hanover-Horton is in full swing this fall. The band director, Mr. Gary Rouster, is getting prepared for the final march at the Homecoming game against Addison. Every morning the band goes out and practices to perfect the formations. The theme of this year’s half time show is Disney music. “We are playing Beauty and the Beast from Beauty and the Beast, The Bare Necessities from The Jungle Book, and Friend Like Me from Aladdin,” Bailey Allison Junior said. Allison is an experienced member of the band and plays the tenor saxophone, a semi-difficult instrument to march and play with. However, the drums and tuba are harder to march with because they are bigger and heavier. One of the hardest jobs on the field is being Drum Major and Katey Anderson is a good fit for the job. “I wanted to be a leader to my peers and help them figure out what’s wrong by standing on the platform. I especially like helping the freshmen because it is harder for them to figure out,” Anderson said. Anderson is a good leader and does a really good job at helping everyone on and off the field. With one Drum Major, eight color-guard girls, and one twirler, the band is smaller than past years. The new members of band have big shoes to fill. “I think the band sounds great this year! For only 35 students making music on the field, we are doing well. We have a nice full sound with every part heard,” Mr. Rouster said. Most of the new freshmen this year are doing a very good job at keeping in time, staying on the right foot, playing their part right, and not messing up. It is very difficult to do all of these tasks at once, but there are going to be new things added this year too. “We will be revisiting “Dancing” for Friend Like Me. We haven’t done a dance in at least three years. They are rather complicated, fun and intense, and are very pleasing to the crowd,” Mr. Rouster said. The band’s final performance is before the Homecoming game, so please come out and support them! They will be doing some complex movements in their routine, but should be very fun and cool to watch.